Harold Gregor is unique in the way he captures the vast expansiveness of the Midwestern landscape. His precise use of color theory within dramatically composed rural settings meld together brushstrokes that are expressive and calculated. Harold Gregor gained national recognition in the 1970s with his photorealist paintings of farm structures and sweeping rural horizons. 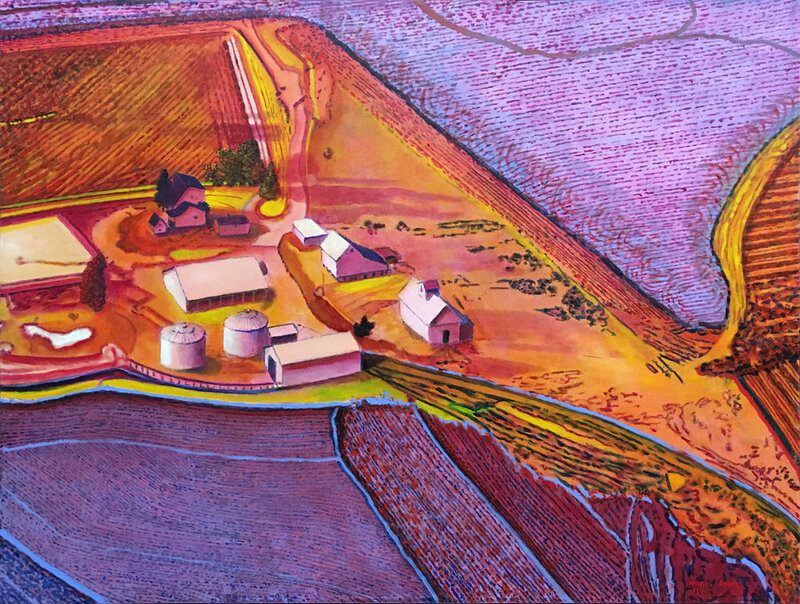 Along with these realist panoramas, Gregor is known for his colorful “flatscape” paintings that combine an aerial perspective with distinctive color choices. In recent years Gregor has begun exploring color abstraction in his "trail paintings" and “vibrascapes”. He continues to paint and show all four styles: realist panoramas, flatscapes, trail paintings, and vibrascapes. Distinguished Professor Emeritus at Illinois State University, Harold Gregor is the recipient of the 1993-1994 National Endowment of the Arts Grant and the Illinois Academy of Fine Arts Lifetime Achievement Award. He has been recognized by Who’s Who in American Art and Who’s Who in Midwest America and has enjoyed three museum retrospectives to date.